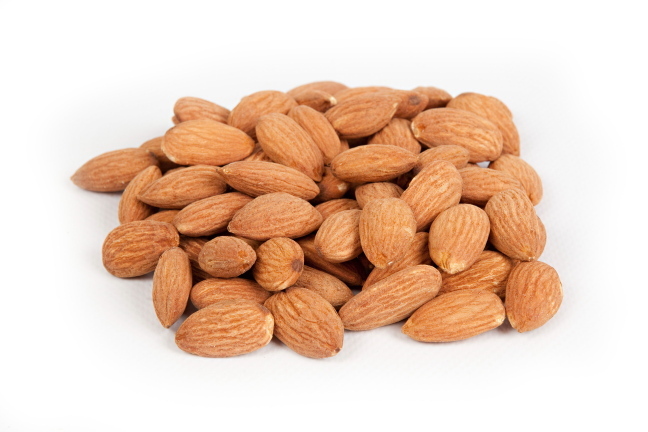 The Almond Board of California has released the MAY ALMOND POSITION REPORT with shipments of +158 million pounds compared to 170 million pounds last year for a decrease of 7.3 percent. Shipments for the month of May were down approximately 7.3 percent versus last May, and year-to-date shipments were up double digits 10.24 percent. Uncommitted inventory is about 19 million pounds or 5.4 percent more over last year. Some major export markets such as Germany, Spain, Netherlands, UK, UAE, Turkey, and China saw decreases in May shipments from 2017 to 2018. New sales for the month of May reflected the market’s activity in general with new sales of only 76 million pounds. This is a decrease of 47.38 percent versus last year. New crop sales saw a decrease as well with sales totaling just over 80 million pounds versus 209 million pounds last year. New sales in May were only 76.1 million pounds compared to last year at 144 million pounds. The recent increase in Trade/Tariff wars with the USA have made many buyers around the world cautious on making new contracts for current and new crop. YEAR TO DATE SHIPMENTS: Are now at +1.950 billion pounds compared to 1.769 billion pounds for an increase of +10.24 percent. CROP RECEIPTS: The 2017 crop receipts are at +2.257 billion pounds compared to 2.134 billion pounds in 2016, and increase of +5.79% over last year. OBJECTIVE CROP ESTIMATE: Will be announced in early July. The Subjective Crop estimate is now at 2.3 billion pounds. Many growers/packers expect the Objective to be between 2.3 to 2.4 billion pounds. Monterey and Independence Varieties look outstanding with a big crop of them coming. The Nonpareil crop is averaging quantity looking on the trees. 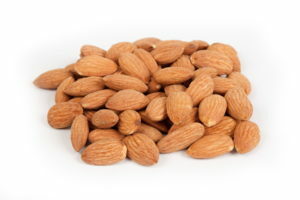 NEW CROP SALES: Over 80 million pounds of new crop almond shave been sold by May 31 accounting for approximately 3.5% of the new crop has now been sold. JUNE SHIPMENTS: We expect June shipments to be down approximately 5-10% as many packers are running low on many key items limiting what they may sell for current crop. Market at a glance: Hesitance and unknowns filled the market the past 30 days resulting in subdued activity. Prices on current crop, maintained levels above $3.00 per pound for sized California and Carmel Types while Nonpareil varied between sellers ranging between $3.35-$3.50 per pound. Most recently new crop started to take shape with some consistent pricing, but buyers hesitated in large part to confirm new crop business due to pricing versus last year and the unknown political situations throughout the world and how that could impact their local trade. This month’s shipment report is reflective of the market unknowns and lack of confidence for what the future holds in world trade. The fundamentals of the 2017 crop aren’t daunting by any means. The projected carryout could be somewhere close to last year’s carry out figure, which as a percentage is a smaller percentage of total supply, and the total percent sold is right in line with last year (87% vs. 86%) at this time. The sentiment of the market however is what might have more of an impact on how the market moves forward versus fundamentals of the market. Cautious buyers will be even more cautious on purchasing opportunities as they arise, and buyers could wait until they sense the market has reached a fair equilibrium point with supply and demand before doing the next round of purchases. The May 2018 shipments versus the May 2017 shipments on an inshell equivalent were up approximately 4% for May. 41,354 tons versus 39,504 last year. 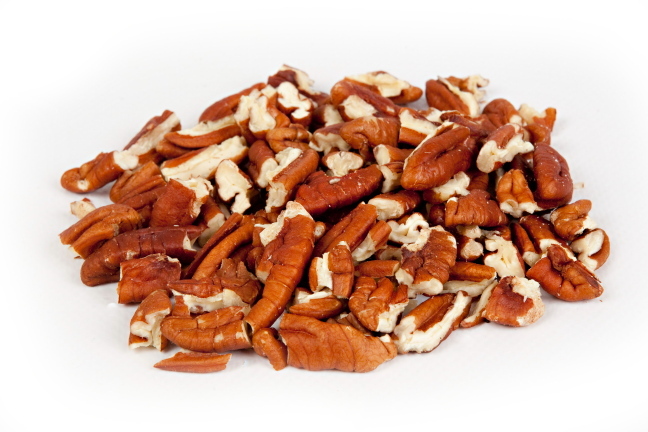 Pricing/Market: The California Walnut packers are coming ending the season where they are completely finished or only have a few loads left to offer. Demand has been slow for current crop currently, and new crop has started in many markets. New Crop: Industry experts believe that this year’s new crop may not be as large as once expected. Some Industry Experts are now predicting the crop to be 660,000 to 700,000 lbs. They believe this may be an “OFF” year for the trees and they are not producing as heavy as once thought. Both the Tulare and The Serr crop look to be up over last year. Unfortunately the industry experts are not as optimistic on the Howard’s and the Chandlers, as Howards are down after two good crops and Chandlers look average at best. The bloom on the Chandlers was completed in 3 weeks and the sizes look to be uniform across all 3 sizes ( 30% Jumbo, 30% Large, 40% Small and Babies ). Right now it is very early and mindsets could change as we get closer to harvest. We will definitely keep you updated. India: Has increased custom duties on both walnuts from 30% to 100% from all origins. 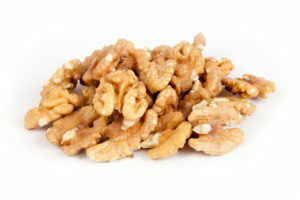 Turkey: Unofficially, the duty for CA almonds and walnuts has increased from 15% to 20%. They have also removed some import licenses which has sent some local importers scrambling. China: China looks to have a big crop, so will also buy less in 2018. They are predicting a crop of 750,000 to 800,00 tons. Chile: Chile continues to have interest in moving both inshell and kernels since they are undersold from the previous years. With a crop up over 30% from last year, the Chilean packers that are looking to move +30 and +32MM Chandler Inshell. The bigger sizes of Chandler, +34MM, and +36MM look to be well sold as there were less of them than last year. The bloom was 2 to 3 weeks early due to a record breaking mild winter. Due to warm weather during the early part of the bloom, bloom was short lived, and the fruit set was light in all areas. A frost at the tail end of the bloom damaged 15% of the orchards, those above 1400 m altitude. The farmers will start to harvest in the last week of June, the weather has been very unsettled this year so there is concern about rain during harvest. Due to the light set the fruit size is large,we estimate that over 80% of the fruit will be size 1 through 4 with the remainder 20% size 5 through 8. 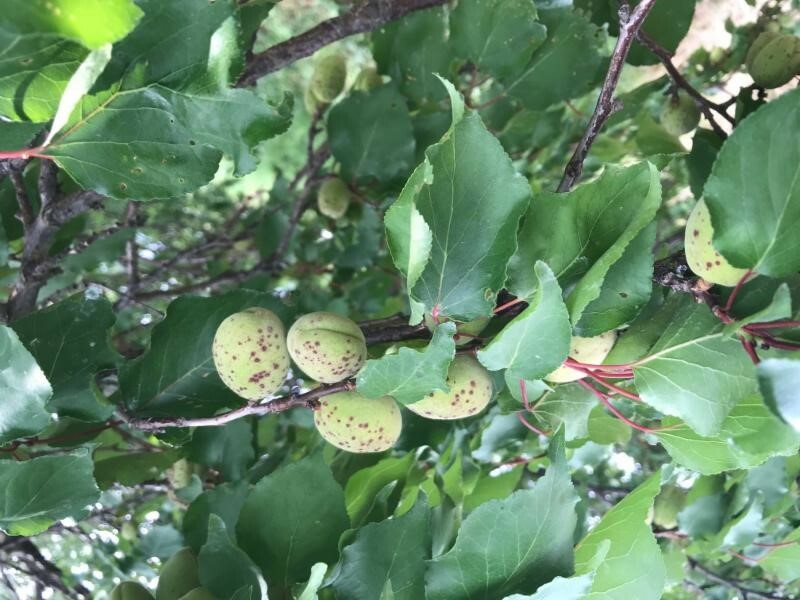 Due to an unprecedented 22 rainy days during May, including 12 days of thunder and hail, the crop has a very high instance of speckles and hail damage. 88% of the orchards visited had hail and or speckling in excess of 20% of the fruit on the trees. Over all we estimate 40 to 50% of the crop is blemished. We estimate the crop is of a similar size to last year, currently there are 110,000 to 120,000 tons dry equivalent on the trees. This tallies with the industry consensus and the official surveys. 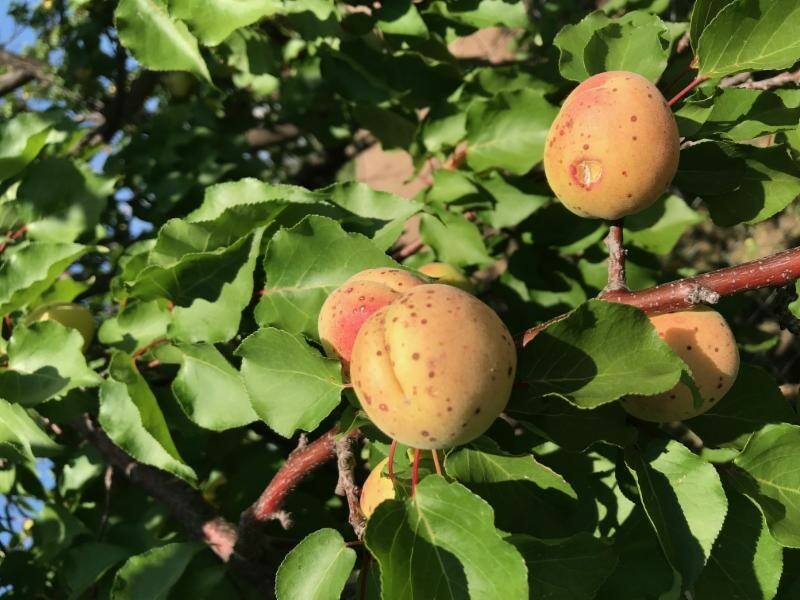 Harvested tonnage will depend on the amount of blemished fruit that the juice industry buys fresh, and the price of industrial grade apricots, if prices for the worst blemished orchards fall below the cost of harvest as they did last year then farmers will again leave the fruit in the orchards. Many farmers took insurance against hail damage, and are being compensated accordingly. We expect an excess of unsulphured fruit once again as farmers with speckled fruit will not sulphur the apricots in an attempt to camouflage the defects. The abandoned acreage continues to outpace the new plantings which are extremely rare, as a result the potential tonnage in future years is expected to continue to shrink. The minority of growers who have unblemished fruit can expect to receive a good price at the opening as packers with high spec clients will have to compete hard for the clean fruit. Following last years experience when prices opened at the season low, then rapidly doubled, farmers are not going to drop prices at the opening this year. We expect prices to open at similar levels to the current crop closing prices, with smaller sized fruit moving higher to close the gap with larger fruit. There will be a shortage of size 5 and 6 which have become major sellers particularly for soft fruit. There will once again be a wide price difference between packers based on the quality they supply. Current crop prices are now within 5% of last years average prices, and well below the 5 year average, as such it seems quite likely that the crop can be exported in its entirety at current price levels. Speculative sellers having been burnt last year are notable by their absence, the majority of packers will start to offer towards the end of this month when the harvest starts and the price of fresh fruit has been established. The Lira exchange rate has stabilised following sharp falls in May due to economic and political uncertainty. The rate is expected to hold around current levels up to the election on 24th June, thereafter a win for the incumbent party is likely to see the Lira strengthen, perhaps significantly, however a non conclusive result may trigger further volatility. Exports in May were 5,941 tons, compared to 6,602 last year. Year to date exports are 87,419 tons compared to 77,841 tons last year. Average price for whole apricots in May was $3282 per ton, average price year to date is $2914. Size 1 through 4 is now sold out. We expect to finish the year with total exports of 96,000 tons, domestic consumption of 7,000 tons and a carryover of not more than 10,000 tons most of which is blemished and undersized fruit, leading to a tight supply situation at the start of new crop.